Vomiting and/or diarrhea may be induced by several different things; viral infections are the most common cause. 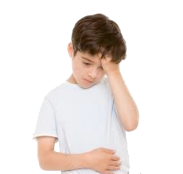 Most vomiting stops within a few hours if some simple steps are followed early in the course. Dietary changes will usually hasten the recovery. If your child is under one year of age, it is not uncommon to regurgitate (spit up) occasionally. Regurgitation usually consists of 1-2 mouthfuls as opposed to the more forceful amounts that are characteristic of vomiting. The purpose of dietary change (or more specifically, giving clear fluids) is to allow the stomach to rest. Give one teaspoon (5ml) clear sweetened (NOT SUGAR-FREE) fluid every fifteen minutes for the first hour. This can be Pedialyte, Gatorade, Jell-O water (one packet mixed with one quart of warm water), colas, ginger-ale, other soft drinks (stir to de-fizz), sweetened weak tea, or any clear fluid. Advance to one tablespoon (15ml) of the above every fifteen minutes for one hour. Advance to small sips at frequent intervals over the next 3-6 hours. If vomiting recurs at any time during the above plan, wait one hour, and then restart the regimen. Begin with one teaspoon every fifteen minutes. If your child vomits again, call the office, as I shall want to discuss the individual case more thoroughly and perhaps proceed with additional treatment, such as a suppository, or we may need to see your child in the office. If your child goes to sleep during the above, begin the plan where you left off when he/she awakens. After eight vomit/diarrhea free hours, gradually return to the normal diet. INFANTS & TODDLERS: Applesauce, rice cereal, Jell-O, bananas, clear soups. OLDER CHILDREN: Dry toast and honey, bland clear soups, applesauce, bananas, Jell-O and soda crackers. REMEMBER, IT MAY TAKE TWO TO THREE DAYS TO TOTALLY RETURN TO A NORMAL DIET, SO DO NOT RUSH IT. CLEAR FLUIDS MEANS NO MILK OR JUICE!!! If fever is present in addition to vomiting and/or diarrhea, an over the counter suppository for fever may be used. Follow the fever sheet instructions. If fever is greater than 102° during this period you may sponge bathe. Your child should be seen in our office for fever over 101°. VOMITING PERSIST BEYOND TWO HOURS. THERE IS BLOOD IN THE VOMITUS OR STOOL. THERE IS ABDOMINAL PAIN MORE THAN TWO HOURS. THERE IS ANY CHANCE OF POISONING (PLANT, MEDICINE, ETC.). CHILD IS UNDER SIX MONTHS OF AGE.